I have always said that there is a cycle that we go through with each and every CF workout of the day (WOD). I have explained it to many people, and I finally created this graphic to demonstrate what I mean. You have to click the graphic to see it. I can’t figure out how to make it big enough to see without clicking on it…suggestions welcome. What do you think? 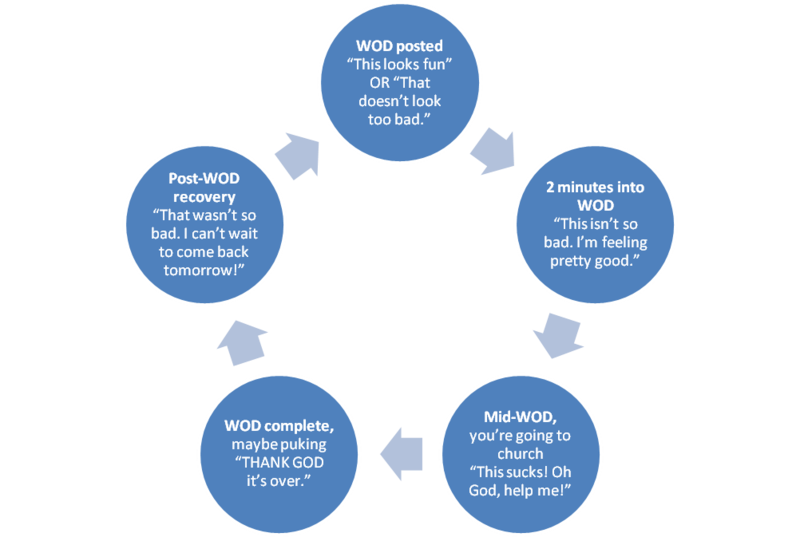 Do you go through this cycle when you CrossFit? I don’t usually talk about my professional ife on here, but this book demands to be discussed. So here goes! Join me! Recently I picked up Sheryl Sandberg’s hotly debated book “Lean In: Women, Work, and the Will to Lead” on a whim. I have heard mixed reviews about the book so I decided to read it to see what it was all about. Honestly, I had no idea what it was really about until I read the inside cover while standing in the airport bookstore. I now understand why this book has generated so much discussion and debate…and I think that is exactly its purpose! Sheryl provides some facts and statistics that are staggering in some cases, and other that are unsurprising. This is not a book that is all opinion-based. It is a book written based on experience and supported by facts. She discusses some otherwise ignored elephants that exist for women in the workplace and in the workforce…and in life. Don’t misunderstand; this book is not a feminist manifesto. Instead, I believe it is designed to empower women to confront the internal and external forces that cause them to doubt their own abilities and places in the workforce. It is designed to cause us to question how things are and how we would like them to be, both professionally and personally as this world is changing – and the way we work along with it. While I appreciate Sheryl’s perspective, there were some things about her stories that didn’t sit well with me. For one, it seems she got to where she is (COO of Facebook) based on who she knew. She worked for the Treasury and gained connections that way. That’s how she got her job at Google and, subsequently, (it seems) her job at Facebook. She was successful and moving up the ladder swiftly in her early thirties because, in her 20s, she was networked very well. As I am in my early 30s and struggling to make my way through what she aptly calls the Career Jungle Gym (rather than a ladder), I feel old and unaccomplished in my career. And I have no connections by which to gain executive-level positions. She’s right; it isn’t a ladder anymore. It’s a jungle gym. Sometimes you must make a lateral move to reach the top…and there are many ways to get to the top. Oh, and there isn’t just one place at the top. That analogy is refreshing and it motivates me to find a way to the top. It confirmed for me that I do want to lead a team and I can get there. BUT I’m just behind her curve relative to age. God, that’s just depressing. I also do not have the resources that she mentions by which to have a fulfilling career and a fulfilling life with family. Her chapter devoted to not leaving work before you leave…for children…was more of a discouragement. I would like to think her approach is doable – and even allowable my most organizations, but realistically I do not think it is. women hold themselves back and sometimes make mistakes unconsciously that hold themselves back. success and likeability correspond in a big, fat, ugly, unholy way for women at work. In a nutshell, if you are successful you are not liked…by men AND women. there are many double standards, some well-known and others lesser known. Some examples are the differences in pay and differences in the way assertiveness is perceived based on gender (expected by men but viewed negatively when women are assertive or aggressive in the workplace). you can have a nice balance of work and life…if you so choose. She discusses how support from your partner is crucial. There are so many topics that I couldn’t possible cover them all here. Of course, her biggest message is to LEAN IN. And you’ll have to read the book to understand exactly what she means by that. The timing was right and I needed to read this book at this stage in my life and in my career. Its message is mostly empowering and enlightening. And I am glad it is causing so much dialogue and controversy because some of these issues need to be addressed. Since reading the book, I have joined her online community to continue to learn from the book’s message. And I created a group called 30-somethings who are leaning in because, damnit, we can’t all be executives in our late 20s/early 30s! Have you read Sheryl’s book? What did you think?